I am now halfway the record collection that i got from Alex sas, and so far I have made 12 compilation CD’s with highlights from the 12 inch records. I don’t know if I will also make compilations of the LP’s; much of the LP’s are a bit too obvious to do so much effort. But maybe I do a few compilations, adding some tracks from my own collection. Especially the Old School hip hop is worth making a compilation, because I rarely listen to the LP’s anymore. And Alex had some nice LP’s that I never heard. Like Birth of the Souladelic by New Version of Soul, Here come The Lords by Lords of the Underground and Qui seme le vent recolte le tempo by MC Solar. Modern hip hop doesn’t mean much to me. Often I don’t like the lyrics, the music is rarely exciting, and what happened to the flow of the rappers? I hear more originality and style in the Old School rappers than in people like 50 Cent and Snoop. Ofcourse, I miss most of the modern rap, because I don’t really follow what is going on. But if I am wrong, I would love to hear that. 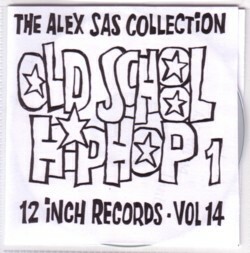 Here is an all time favourite of mine, that Alex had on 12 inch: The Flavor Unit MC’s with Roll with the flava .